Bettas are known for being hardy fish but the type of water you put them in has a huge effect on their health and well-being. Most people think that because they’re kept in such tiny containers in the per store, they don’t require the same level of quality water that other fish do. That thinking is very, very wrong. Tap Water for Betta Fish? Spring Water for Betta Fish? 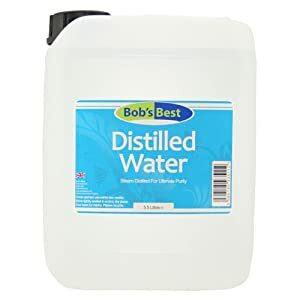 Distilled Water for Betta Fish? 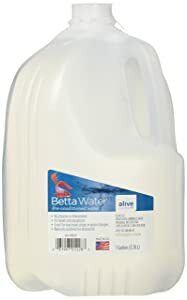 Well Water for Betta Fish? What is the Best Water for Betta Fish? There are a few options when it comes to betta water but they all require slightly different care before they’re ready. Tap water is the easiest and most accessible choice. You might be a little surprised to hear that tap water is actually good for Bettas – but only after you remove some of the added chemicals. Most water that comes out of the faucet is treated with chemicals like chlorine to make the water safe to drink; however, they can be very harmful to a Betta. If you choose to use tap water, you have to treat it with a water conditioner that removes the chemicals from the water in seconds. Once you remove the chlorine and other metals, tap water is actually great for Bettas. It contains a lot of the nutrients that Bettas need to survive. Plus, you can easily get the water to the right temperature by using a thermometer and mixing hot and cold. Another option is spring water. This is actually really similar to tap water only it doesn’t have any chlorine in it to worry about. As long as the pH is appropriate, spring water is a great choice. Spring water is also relatively inexpensive, you and buy gallons of it at the grocery store for only a few dollars. If you keep it in the same room as the tank, you can be relatively sure that they’re at the same temperature which makes water changes much easier. And, because they come in a gallon container, you know exactly how much water you’re putting into the tank. Another option that you will see in the pet store is Betta specific water. What’s special about this water is it’s been conditioned exactly to help Bettas thrive. The pH is just right and there are no harmful chemicals or metals. This water isn’t required and it’s a little on the expensive side but if you don’t want to worry about conditioning your own, it’s an option. Is there any water you shouldn’t use? Actually, yes. It’s a good idea to stay away from distilled water. Distilled water is collected from vapor and loses all of the minerals and nutrients during processing. It’s pure water but your Betta also needs the nutrients that the other water types provide. If you use distilled water, your Betta might be lethargic and could eventually die. Well water is another one that’s iffy. If you live in a rural area, you probably rely on well water. This water hasn’t been treated at all and can therefore have a lot of contaminants that are harmful to your Betta. If you want to get your well water tested, you can usually take a sample to the pet store and they will do it for you. Then, they can also tell you the chemicals you need to appropriately treat the water to make it Betta safe. The best water for Bettas is the Betta water that you’ll find in a pet store. The reason is simple, it’s because it’s actually been specifically formulated for Bettas. That said, it is certainly not necessary to use Betta water. It’s expensive, especially in the long term. One way to use Betta water effectively is to start your tank with it. When you first come home from the pet store with your new Betta and aquarium, get some Betta water, too. Then, use another kind of water when it’s time to do water changes. This way, you have a good foundation to start with and you can start your aquarium off right. If you don’t want to use Betta water, either tap water or spring water is great. Remember, though, each requires a different kind of preparation. With tap water, make sure you get a water conditioner that eliminates the chlorine and other metals in the water. These are bad for your Betta but the minerals and nutrients left behind are actually really beneficial. As for spring water, you don’t need to worry about chlorine because there isn’t any. What you do need to check is the pH. Bettas prefer a pH of 7 but all spring water is not the same. Once you find a brand that is the right pH, it’s probably a safe bet and you can stick with it. That said, you should still test every bottle just to be on the safe side. You might think that Bettas can tolerate anything since they live in those small containers in the pet store but that’s not the case. Bettas are actually sensitive to a lot of contaminants and you need to be very careful with the type of water you use. Luckily, you have a lot of options. While you should avoid distilled water and any well water that hasn’t been tested, tap water and spring water are both great choices. With tap water, make sure you get conditioning drops to clear the water of chlorine and other metallic contaminants. If you go with spring water, make sure the pH is right. Bettas need a pH around 7 and spring water vary from brand to brand. Bettas are beautiful fish that are often misunderstood. In the wild, bettas survive in some harsh conditions during the dry season but that’s not reason why they shouldn’t have an aquarium full of the best water. If you want to see your Betta thrive, make sure you give it every opportunity to do so, starting with the best water. What Fish Can Live with Betta Fish? How to Take Care of Your Betta Fish? Best Betta Fish Food Available Today? Can you use “distilled water with minerals to enhance taste” for Betta fish!? I have tap water that was tested and there was no chlorine in it,it was fine except for the PH which I can take care of. I’m still afraid to use it untreated. Will it hurt my betta if I still treat the water.